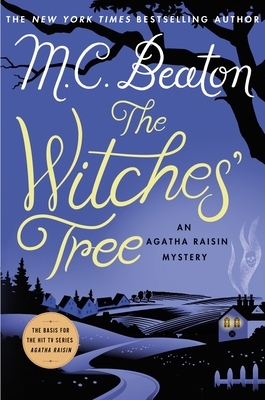 The Witches’ Tree continues the tradition in M. C. Beaton's beloved Agatha Raisin mystery series—now a hit show on Acorn TV and public television. Cotswolds inhabitants are used to inclement weather, but the night sky is especially foggy as Rory and Molly Devere, the new vicar and his wife, drive slowly home from a dinner party in their village of Sumpton Harcourt. They strain to see the road ahead—and then suddenly brake, screeching to a halt. Right in front of them, aglow in the headlights, a body hangs from a gnarled tree at the edge of town. Margaret Darby, an elderly spinster, has been murdered—and the villagers are bewildered as to who would commit such a crime. M. C. Beaton, who was the British guest of honor at Bouchercon 2006, has been hailed as the "Queen of Crime" (The Globe and Mail). In addition to her New York Times and USA Today bestselling Agatha Raisin novels—now a hit show on Acorn TV and public television—Beaton is the author of the Hamish Macbeth series and many Edwardian mysteries. Born in Scotland, she currently divides her time between the English Cotswolds and Paris.